The challenges involved in developing a new car wash project, no matter where it’s located, can be a very difficult and trying experience, as we in the business know all too well. 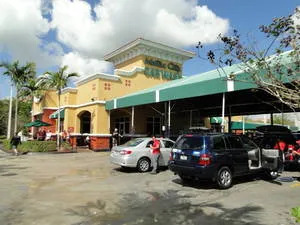 Attempting to open a wash in South Florida, the area along the southeast coast from the city of Jupiter down to Key Largo, typically borders on the insane — even for highly experienced wash operators. But for those gifted with a lot of perseverance, tenacity, grit, and determination — as well as some very deep pockets — it can be accomplished in time. This article will describe the difficulties in the development of a small but highly successful full-service car wash chain over a 15-year period in this specific area. The region known as South Florida, located along the lower southeast coast of the state, encompasses an elongated area approximately 120 miles long and averages some 14 miles in width. Bordered by the vast Atlantic Ocean on the east and the massive Everglades wetlands on the west, it is home to some 6 million full- and part-time residents. Blessed with warm tropical weather, beautiful beaches, and a laid-back attitude, South Florida is well known as a popular retirement area, especially for Americans from the northeast part of the country. 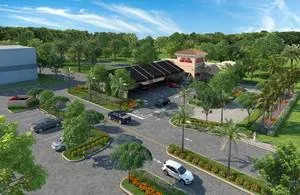 If fact, there are so many retirees living here that many businesses are designed to specifically cater to their needs. Car washing is one of them. While express and flex-type car washes are all the rage throughout most of the country, traditional full-service models are still going strong in South Florida and exceedingly popular. 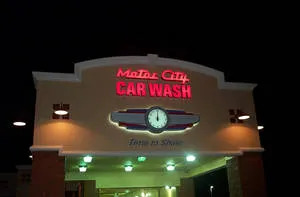 One of the very best wash chains of this type in the area is Motor City Car Wash, founded in 2002 by owner/operator David Daszkal. Signage over the tunnel entrance. Originally from Michigan, Daszkal started his business experience over 20 years ago in the fast-food industry, initially starting out as a manager of an independent restaurant concept, then becoming a franchisee of Miami Subs Grill, a very popular fast-food restaurant chain in the South Florida area. Deciding to change direction a number of years later, he sold his restaurant and entered the car wash industry, gaining experience as a store manager of a successful traditional full-service car wash for three years in the city of West Palm Beach. With this knowledge under his belt, he then created the concept of Motor City Car Wash, found a great site, and had it designed and built. Finding success, he subsequently grew his company into three more locations over a 15-year period. Now he is starting to construct his fifth car wash location after spending three long years to acquire the property and get county approvals. With the wash equipment company selected, the next item on his agenda was to hire an experienced architect, one who could fully understand his concept and get it through South Florida’s infamously strenuous planning and zoning (P&Z) approval process. Utilizing the same ones that successfully designed his restaurant, he hired the architects who would later found Car-Wash-Architect.com. The site selected for his first location was in Boynton Beach, a city lying between West Palm Beach and Boca Raton. 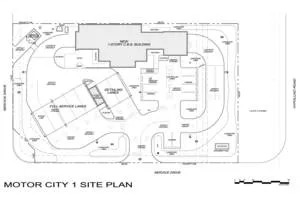 This being Daszkal’s first car wash project, as well as the first car wash designed by Car-Wash-Architect.com, considerable time was spent researching and working with the pros at Sonny’s to get the site layout and building floor plan done right. Located at a new commercial development on a busy street, the relatively small site (0.86 acres) was surrounded by roads on three sides with access at the middle, limiting both conveyor length (106 feet) and stacking. The best feature of the site was that we were allowed to zero-property line the building on one side, enabling us to pack in a lot more car wash than we normally would on a site this narrow (154 feet) and, by placing the finishing and detailing lanes at a 45 degree angle, we were able to fit in a total of 7 lanes. Special attention was paid to the building style and façades to give it interest and road-appeal to potential customers, yet still meet budget limitations. The final design was an artful mix of Mediterranean and Art Deco styles, both very popular in the South Florida area, and has proven to be very popular with customers. This became the prototypical design look for all of Daszkal’s other locations that followed. The only issue to get final building department approval permits was satisfying the landscaping design reviewer’s demands. The few issues during construction were that the sewer lateral elevation was incorrectly shown on the city’s as-built drawings (it just barely worked, avoiding a lift station), and excessive rainy weather delayed the project completion by five weeks. 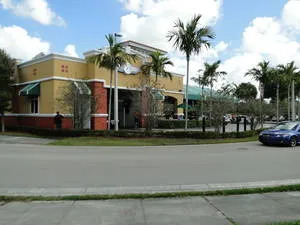 The site Daszkal selected for his second location was located in West Palm Beach on a busy road but in a poorer part of the city. The main challenge of this site was its very small size (0.58 acres) and that it was a corner property with restricted access, again limiting both conveyor length (97 feet) and stacking. The only reason that we were able to achieve even that conveyor length was due to the city changing its codes to allow extremely small building setbacks and low landscape-area requirements. The finishing area in sight of the tunnel exit. The tower structure allows for elevated signage. Even with this very tight and difficult site, we were able to fit in a total of five finish and detail lanes. Compared to the first site, the approval process for this location was much more difficult and contentious. The greatest problems were that the area was considered “historical” by the local historical board and they fought the appearance of the building until we showed them other buildings in the area that had similar features; then the city building department presented us with an endless number of comments again and again until we had to threaten them with a lawsuit if it continued. 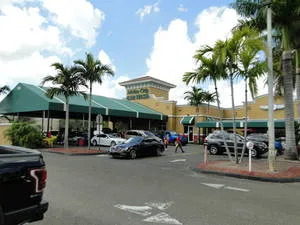 The site Daszkal selected for his third location was in Royal Palm Beach, a new city located west of the city of West Palm Beach. This 1.33 acre property was much larger than the previous two, but featured an access road running along two sides of it, and a cross-access parking area and road along another, making the actual buildable area rather tight. This again limited conveyor length (96 feet), but provided adequate stacking and lots of parking. The final layout also featured five finishing and detailing lanes under an enormous fabric awning structure. The odd shape of the site also allowed the final building design to be some 1,200 square feet larger than either of the previous two locations. This extra square footage allowed us to design a wider tunnel, a much larger customer lobby, two offices, and an employee break room. Since we were farther off the highway and behind a tall landscaping berm, we also increased the height of the building by four feet and installed a tall tower feature to get the signage above the trees. The greatest challenge of this site was getting approval from the tenants of the large shopping center where it was located. The restaurant next to the site proved to be the most difficult, with us completely changing the design several times to accommodate them, and finally threatening them with a lawsuit before they finally approve it. The fourth site selected by Daszkal was in Orange Park, a suburb of the major city of Jacksonville in extreme northeast Florida. 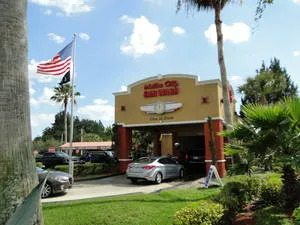 At this location he made the decision to bring in a partner, calling the wash Big City Car Wash instead and opting for an entirely different building style, appearance, and business model. 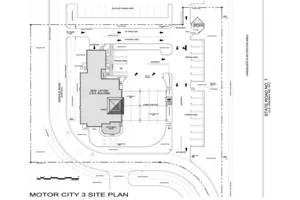 Located on an elongated 0.83-acre site 300 feet long by a tight 116 feet wide, the site only worked due to the fact that it borders a parking lot of a major restaurant and by cross-access agreement utilizing the restaurant’s entry/exit out to the street. The 3,600 square foot main building features an eye-catching design with lots of road-appeal and an incredible customer lobby. A small separate service building houses the central vacuum and a towel cleaning room. This smaller building borders on five large adjacent cantilevered awning structures, each handling four vehicles. Starting off initially as a modified full serve, several months after Big City Car Wash opened, the facility was converted into a flex-wash with free vacuums, a wash model that local customers were much more familiar with and required to compete with the nearby flex and express models. After this modification was made, profits and customer satisfaction increased considerably. Daszkal retained a share of this wash for five years before selling out to his partner and concentrating on his other washes in South Florida. 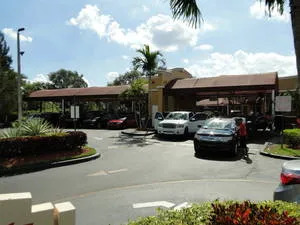 After selling another of his locations (the one in West Palm Beach) around four years ago, Daszkal decided to build another car wash and started the very difficult process of acquiring property. After taking around a year to find the right location, he finally settled on a site located in the West Boynton Beach area, about six miles southwest of his original wash location. This latest site is roughly square in shape, some 1.15 acres in size, and has the entrance road of the small commercial development it is located in running through one side of it, and an access road running along the southern property line. All of these roads and the large landscape setbacks make the actual buildable area rather tight, again limiting conveyor length (101 feet), but allowing adequate stacking, a good amount of parking, and six long finishing and detailing lanes under an enormous fabric awning structure (90 x 45 feet) with the capability to handle up to 30 vehicles at one time. This new site layout allows better traffic flow, stacking, and finishing areas than any of the previous locations. In addition to the wash tunnel, there is a decent-sized customer lobby inside, two offices, two restrooms, a storage room, towel-cleaning room, large equipment room, and an employee break room. Since we were farther off the highway and behind a tall landscaping berm and many trees, we again kept the building design high and installed a truly massive tall tower feature to get the signage well above the trees and to get potential customers to notice it out on the street. “Finding a new car wash site that meets basic criteria is difficult and requires patience. Initial requirements consist of a thriving trade area where other retail businesses are achieving sales above average for their chain and their industry. Also, new potential sites must be visible, accessible, and, most importantly, near targeted rooftops. It’s extremely difficult to identify a new potential location that meets zoning requirements in Southeast Florida and even more difficult to achieve in municipalities located within Palm Beach County. “After identifying a potential site, an operator must also negotiate a long enough permitting period in their terms of purchase or lease agreements that allow sufficient time to obtain governmental use approvals prior to closing on the property purchase or lease. Otherwise, one will have to utilize the obtained property for another use if car wash use is not approved. The proposed site must have a good chance of obtaining county or municipality zoning and use approval, which, in most cases can be a long and costly battle. Years ago, getting local government approval for a car wash or even a fast-service restaurant with a drive-thru was simple and relatively easy, by simply filling out an application and presenting the project to a municipality’s staff and decision-making board members by the business owner and the hired architect. “However, on my last project in Palm Beach County, I had to hire a land use consultant, a land-use attorney, a traffic engineer, a civil engineer, landscape architect, as well as the project architect. The initial process consisted of scheduling many meetings with county planning and zoning staff, then presenting my project for approval from the planning board. The second phase became a more in-depth process in obtaining final county commission approval, which has the final vote and power to approve or deny a project. “Oftentimes, a new car wash project should also plan on opposition from residents and local commercial business and property owners that may try to block a car wash approval for a number of potential reasons. In my recent case, I have a business neighbor that was adamantly opposed to my car wash project, claiming increased traffic, noise, and use “inconsistency” concerns. I also encountered resident-driven resistance from the local homeowners’ association group that wields much influence over Palm Beach County’s Commission Board. “The project was negatively impacted by this nearby business owner, simply because he didn’t want to be next to a car wash. Because of this opposition, the process took over one year and was extremely costly. After my team of consultants and I received our final approval, it was time to finish plans, close on my purchase of land, and move forward. However, within the 30 day “contest/protest period” after my final approval, the business neighbor decided to hire an attorney to contest the county’s ability to approve the project, stating it was “not consistent with county comprehensive plans.” Consequently, I now had to fight a lawsuit with the county against a neighbor or I’d be building “at risk” if my project were to get overturned by the plaintiff, my commercial property neighbor. This daunting process involved court hearings, hiring a land-use litigation attorney, and mediation hearings and was nearly unbearable, but I still marched on. I successfully overcame the lawsuit mainly because my opposition could not continue funding it. But a new project can expect opposition, and even if you win approval they have the right to contest it, which will further stall the project and cost as much as $150,000, if not more, to fight it. Once this new facility is opened, Daszkal will again have three Motor City Car Wash locations, all less than 10 miles from each other, making it easy to manage and staff them. 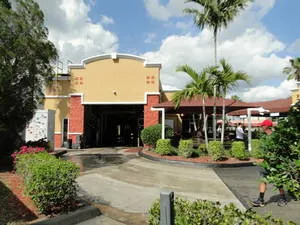 In South Florida his chain has been exceedingly popular with customers over the years due to its superior customer service, excellent washes and detailing, and highly attractive and well-maintained facilities. This latest addition to his chain should prove to be even more successful since it is the largest and most elaborate design built to date, incorporating everything that both he and his architects have learned about car washing over the last 15 years. We applaud his continued success. Christopher Crawford is with Car-Wash-Architect.com. He has written a number of major articles for this magazine over the years concerning the design and construction of new car washes projects. You can visit his company’s website for more information about the services they offer, or call them at (561) 212-3364.